In a row over British-paid advertisements accusing Prime Minister Nawaz Sharif of neglecting the education sector, the politicians have demanded an explanation over UK aid paying for front-page campaign against the government. The Telegraph reported that thousands of pounds of British taxpayers’ money has been spent on newspaper adverts in Pakistan accusing the government of failing to tackle the country’s education problems, igniting a row over political interference. The advertisements appeared last week, some of which covered half the front page. They accused Nawaz Sharif of not doing enough to tackle the country’s education emergency and only discussing the issue when foreign figures – such as Gordon Brown – visit. They were paid for by Alif Ailaan, an education charity set up with British aid. Senior figures in the government said they were furious and demanded an explanation from the UK’s Department for International Development (DfID). “Is this how education money is being spent? It is insulting to the prime minister, spending all this money on full-colour front page ads,” said Tariq Azeem, a senior official in the ruling party. The row highlights how millions of pounds are being used for public information campaigns, rather than being spent directly on services. However, the advertisement’s creator says it serves a vital purpose, increasing pressure on the Pakistan government to tackle its own problems rather than relying on foreign support. Britain’s spending in Pakistan is already a political hot potato in Westminster, where MPs have repeatedly demanded reform in the country’s tax sector in return for aid increases. They ask why the UK is pumping millions of pounds into a middle income nation that can afford nuclear weapons and where less than 1 percent of the population pay income tax. The timing could not be more embarrassing for Pakistan. Last week, its finance minister unveiled his budget, which saw a decrease in federal education spending of about 1 billion rupees (£6m). While federal spending is dwarfed by provincial budgets, critics said it demonstrated the government’s ambivalence to the issue in a country where 12 million children do not go to school. At the same time, Britain will increase its spending on education to £200m in the year ahead. The newspaper adverts were bought by Alif Ailaan, a £2.5m campaign funded by the UK to persuade Pakistan to invest more money in education. 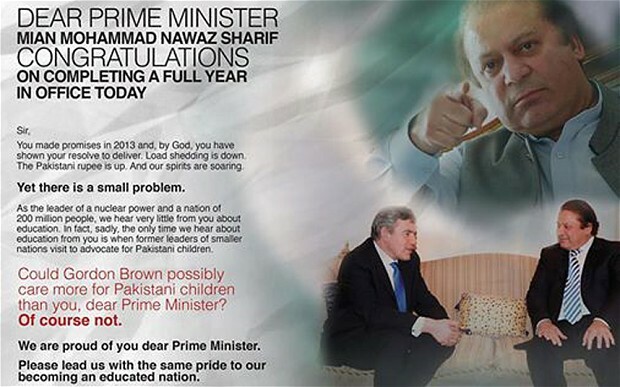 They feature a photograph of Brown – now the United Nations special envoy for education – sitting alongside Sharif, who is accused of neglecting the subject. “In fact, sadly, the only time we hear about education from you is when former leaders of smaller nations visit to advocate for Pakistani children,” it says. “Could Gordon Brown possibly care more for Pakistani children than you, dear Prime Minister?” Although it ends with “Of course not,” it has raised eyebrows among British diplomats irritated by the tone and reference to “smaller nations”. Mosharraf Zaidi, campaign director of Alif Ailaan, said British money could only go so far. The adverts had succeeded in stimulating debate, increasing pressure on the government to seize the initiative on education. A spokesman for DfID declined to discuss whether the adverts were an appropriate use of British money. Helping Pakistan is one of the British government’s top priorities, attracting more than £1 billion in aid over four years. Officials claim that tackling poverty and promoting democracy will help build a more stable country, stemming the threat from Islamist militants. Lol – yes well we all know where the aid money is going. Let’s see some stats on schools built, education grants given, teacher incentives etc. It will be quite clear that most if the aid money is going into corrupt politicians pockets. While at the same time were trying patriotic khaki generals for treason. Something terrible terribly wrong here. It feels terrible to know that governments of other countries are more willing for social uplifting in Pakistan than our own!